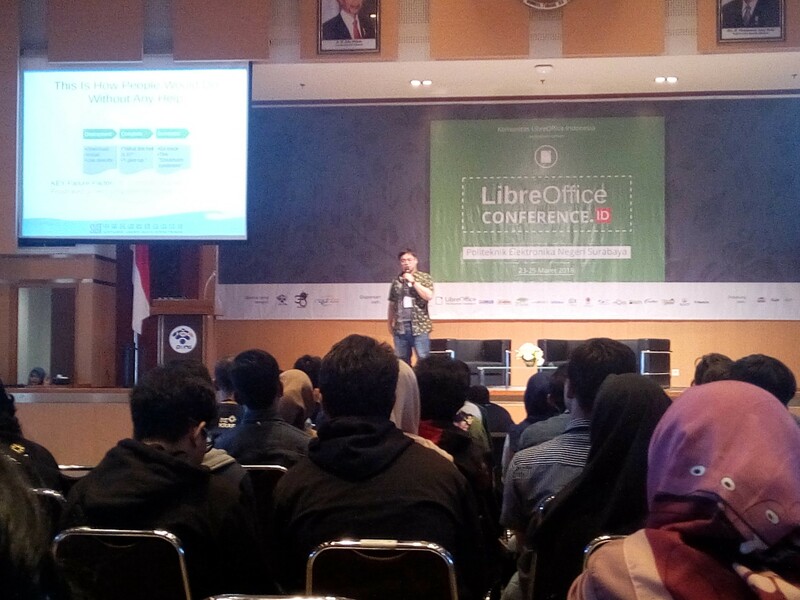 Second day of LibreOffice Conference Indonesia is filled with awesome information about open source software and it’s communities. It’s way more crowded than first and attended with many people i don’t know. Attendees were given a goodie bag which contains green LibreOffice Conference t-shirt, id card, endless os installation disk, and event rundown schedule of the event. To be honest i feel like i haven’t paid much for the event ticket, but it already gives me way too much stuff. The opening ceremony is rousing, and the participant looks enthusiastic at the start of the events. The first speech is given by Franklin Weng, one of the foreigner speaker from The Document Foundation. Weng is a member and board of director in The Document Foundation, he’s an awesome person who have been contributed in open source project for more than 20 years. In his speech Weng tells us about what we (they’ve?) done in Taiwan. In short they succeeded persuade the Taiwan government to use LibreOffice for their office suite needs, but his real intention is to make their government use open Document format, instead of closed one (like doc, ppt, etc). This persuasion didn’t start large, but it’s start from smaller action that trigger the chain reaction of the open source community and The Document Foundation altogether. He also explain about the migration protocol used to liberate documents of Taiwan government. Weng also emphasize that we shouldn’t use LibreOffice to replace Microsoft Office, instead we should use LibreOffice because it is the best office suite to generate odf(open document format) documents. One of his quote that i really like is “Together make it Better” it points out about the LibreOffice and other open source community that would love to help if someone is having a problem, and contribute to it’s project to make it better. Weng speech give leaves us a question “what is the advantage of using Open Document Format (odf) ?”. But since the time is up, they told the audience that he would like to explain about it later before everyone could ask. Indonesia Ministry of Communication and Information (MENKOMINFO), continue the event with the speech from Riki Arif Gunawan and his team. They told us about their program on developing more startup in Indonesia that uphold the open source development model. They also introduce digital signature and how it matters in the digital communication, to ensure someone real identity, and avoid scams. After a short snack break the event continues with parallel class, which have their own topic and divided by technical, LibreOffice usage, and community speech. If it possible i wish i could attend every class in the same time, but too bad i cant. Please bear with me on each class that i did choose. The first class i attend to is community speech, with Umul Sidikoh with topic ”Why so difficult to recruit female contributor”. She state that to become a contributor it is mean to contribute. Umul tells her story to the audience from where she starts learning about open source, up until now, where she successfully become a speaker in multiple event source event, even going to the Open Suse Asia Summit 2017 in Tokyo, Japan. In her research for understanding a reason of difficulties in recruiting female contributor, she found out that most of female in Indonesia still doubt using free and open source software. Another reason of this difficulties are condition where most people (especially male) sees a female contributor as target of interest instead of potential contributor, and might make them feel uncomfortable inside the community. Umul also adds that open source contribution doesn’t always involving a code , there are other way to contribute to an open source project through translation, documentation, test, feedback, and many more. She also encourage everyone to take action by quoting “Action may not always bring happiness, but they’re are no happiness without action.”. In the end of her speech she finishes by inviting everyone to discover open source, and start contributing by doing what we good at, and contribute where we want to. After the lunch break the event continues with another parallel class, technical class with the topic of “How to write a undergraduate thesis using LibreOffice writer” is a class that i decided to attend. The reason is simple i want to know how to write a proper undergraduate thesis with LibreOffice in order to graduate from college. This topic is presented by Mukhamad Nurul Irfan a friend of mine, an active open source community member. In his speech Irfan cover on how to use styling in LibreOffice write to generate undergraduate thesis document, sharing his tricks using LibreOffice writer, and tells his experience on writing his undergraduate thesis. I was into desktop ricing since installed arch linux, of course another thing i want to know is modifying LibreOffice to look more miku-ish, and suitable for me. Fortunately this next class cover my interests, “Personalize LibreOffice Appearance” presented by Rania Amina another friends of mine who love his workspace comfortable and beautiful to work with. In his speech Rania explain that, LibreOffice is powerful and feature rich, but sometimes people says that they doesn’t like how it looks. Rania adds that LibreOffice is much more customizable ranging from it’s icon, tool placement, up to it’s splash screen. This gives user more choice on how they could arrange, and personalize their workspace in LibreOffice. With short time Rania is able to explain how many theme component that able to be modified in order to personalize how LibreOffice looks. Next class i attend to is presented by Ms. Nur Aini Rakhmawati about “Let’s Decide Your Step With LibreOffice”. I thought this would be more of tricks and tools in LibreOffice, but i was wrong. She presents the use of LibreOffice as an calculation tools to calculate data as Analytical Hierarchy Project providing decision support system. Using data that collected through survey, LibreOffice Calc is used to give summarized information regarding the data, to help people decide their options effectively. This system use complex calculation that, i myself still hard to understand in short time. Nevertheless it was an awesome to see LibreOffice capabilities to such extent. As promised, Franklin Weng continue his speech in last events for the day explaining about . Weng started his description about document, and it’s history from ancient china, up till now. Weng stated that at the age of typewriter qwerty keyboard is designed with intention to slow down typist speed so typewriter slow key movement will not get jammed in the process of typing. This does surprise me since most of today keyboard i know use qwerty design. Weng continue his story about documents from the old age of hard formatting up till now where we can use styling in our document to create a beautiful document effectively. Up till now i still doubt the use of styling feature in office suite, but now it is clear that i was wrong and i need to learn more about benefits of styling feature in office software. Weng also explain about Document Generation, and Document Exchange terms as the name says it referring to document generation and exchange, but in this present time we use digital document made both of those term matter, and correspond with one another. Weng adds that this condition necessitate interoperability of each documents. This interoperability gives us a way to work better together. In order to achieve such interoperability we need open and stable format, connect the typesetting concept, and use Open fonts. In this demands Microsoft started using new format such as .docx (but this just add another interoperability issue in document exchange with adding new file type). Another issue with Microsoft Office is it’s lack of interoperability feature, another cause that encourage people to purchase later version of Microsoft office, and constrain it’s user to keep relying on their products. The needs of working together force us to use interoperable document format that facilitate us, and Microsoft Office is not the solution of this problem. Not to forget Weng also answer question about the reason to choose open document format over, the other is it’s Interoperability. words interoperability without in short is an ability of a system to maintain it’s form even when they have updated over and over (at least that what i understand). with this interoperability latest ODF document can be read by LibreOffice with it’s version that have aged around 5 years, and still looks the same. Even though Microsoft Office also able to generate ODF files, but still LibreOffice is the best Office Suite to generate an ODF files. Weng also encourage everyone to make use of Styling Feature of LibreOffice, so other software could understand how will the document looks. There also Open Fonts which is Free to increase document interoperability without the needs to spend more money to buy fonts. FYI font bundled inside Microsoft product is also licensed, which means it’ll be bad if they found out that you violate their license (Calibri fonts is priced for 129$). I’ll update this article if there are any change for where the slide will be published, for now what we can do is just wait. I might also write another article for class specific topic later after they published the slide material so hope that the day comes. Thank you to The Document Foundation, LibreOffice Indonesia community, and everyone involved for this awesome event. Thank you for your time reading this article. feels free to give any feedback or anything you might want. it keeps me motivated in writing these article. 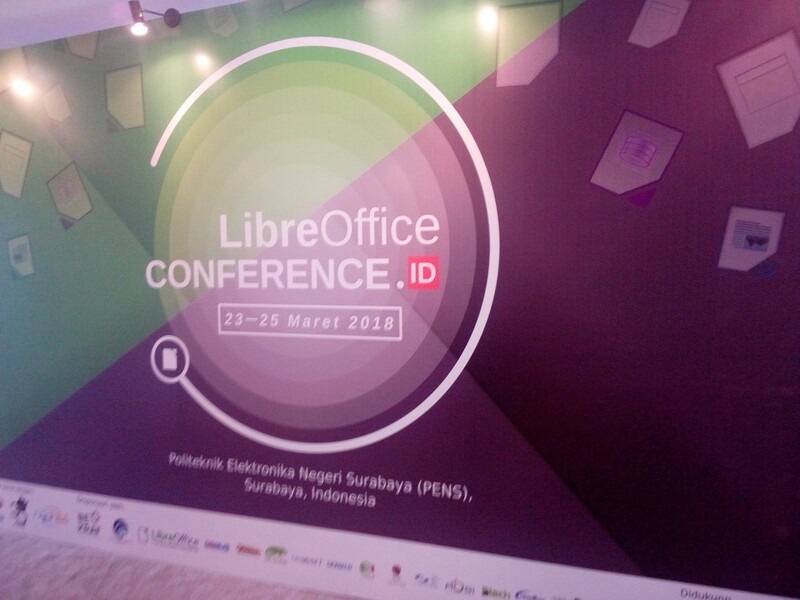 There also will be another article summarizing day 3, the last day of LibreOffice Conference Indonesia filled with many more cool speaker and topic to know.